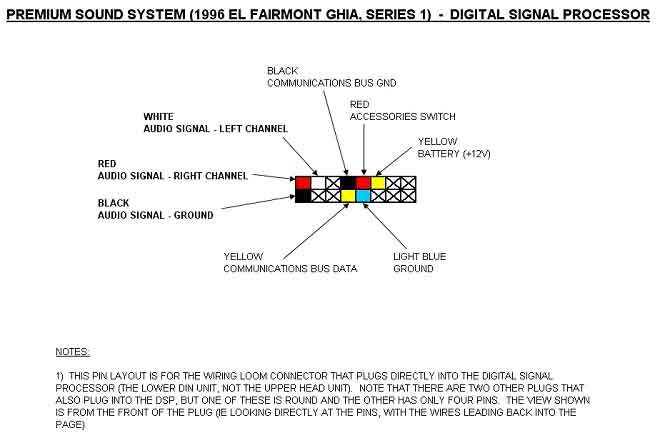 This document describes the installation of a auxilliary input into an EF/EL series falcon fitted with the premium sound. It uses the input for the cd stacker and allows you to plug any mp3 player in using a 3.5mm headphone socket. In order to identify the audio signal wires leading into the DSP, I pulled apart the in-boot CD stacker and was able to establish the pin out from the CD stacker. This is shown below for those who want to cut into the wires at this point and have their auxiliary input located in the boot. For the EF series the cd stacker has a round plug and not a square one. 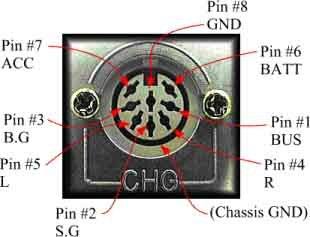 Below is an image of a round 8 pin DIN plug and each pins function. 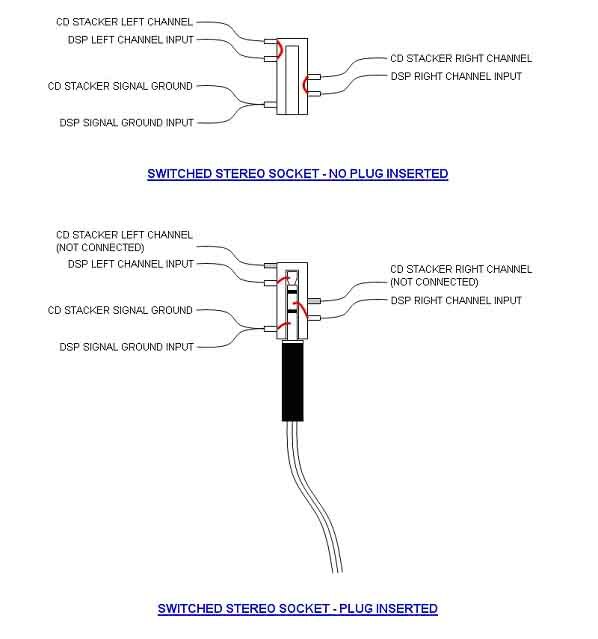 Either an open socket or a switched socket can be used, but they are slightly different in the way they work as explained below. A switched socket is without doubt the more elegant solution. 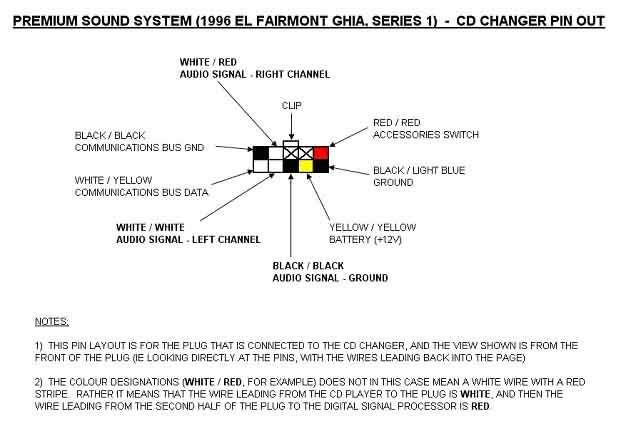 If you use an open socket connector, both the CD stacker and the auxiliary input will be connected at the same time. Thus if you have a CD playing and your MP3 player connected to the auxiliary input, then you will hear both tracks playing at once, overlaid on each other. An interesting effect. Originally I had hoped that the pause function on the CD player (hit the CD button while one is playing to pause / play) would simply "pause" the CD, allowing the MP3 player to be heard on its own. Unfortunately the pause function also mutes the stereo, so that the MP3 player cannot be heard either! You will now need to solder up your "MP3 adaptor" to plug inline with the existing CD Changer - DSP Bus. 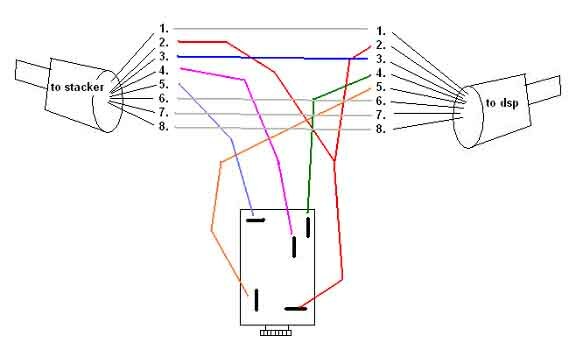 Using the wiring diagram below (if using a switched socket) put the piece together. I would suggest making the item with the male and female 8 pin DIN plugs so if you ever want to remove it and put the stereo system back to stock, it is simply a case of removing it. I installed the Jaycar PS-0132 socket just below the cigarette lighter socket and slightly to the left, as shown in the photo below. This socket requires a 6mm diameter hole, but make sure that you start off with a smaller drill bit (say 3mm), then slightly larger (say 4.5mm), and then either a 5mm or 5.5mm before using the 6mm drill bit. The 3mm drill bit allows you to accurately position the pilot hole, and then increasing in size in a couple of steps avoids tearing around the edges of the hole, resulting in a neat finish. Also, make sure that you do not use too many revs on the drill or the drill bit will heat up, melting the plastic nicely. Use a large bit now by HAND!!! and clean up the edges gently. The plastic surround is a little too thick for this stereo socket to protrude properly so you will need to slightly taper the front of the hole so the socket nut will sit flush. Be very carefull here so you don't damage the front facia or tape too deep. You only need about a 1mm indent on the front for the locking nut to fit. Note that the socket must protrude sufficiently for the plug to go all the way into the socket, or you will have contacts breaching across the insulators on the plug and may end up with only one channel working, no channels working or other weird effect. Plug one end into your MP3 player and the other into your new auxiliary input socket. Press â€œCDâ€ on the car stereo. If youâ€™ve used a switched socket, youâ€™re up and away! If youâ€™ve used an open socket, select â€œDisc 1â€ on the stacker, and set the player to â€œRepeat Discâ€. 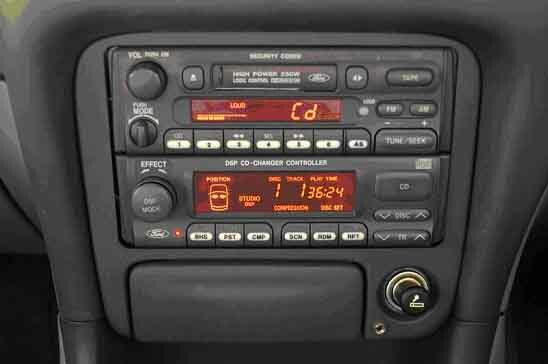 If you use the switched stereo socket, then there is no dodgy CD required. The switched stereo socket does all the switching required. When you plug in your MP3 player, the sound from the CD stacker will automatically be cut and the MP3 player will be fed through to the stereo, although admittedly the display will continue to show the CD playing. The stacker outputs at a set volume level, whereas your MP3 player headphone jack is variable level. I set my MP3 player at full volume, and this gives similar volume to the stacker. I have noticed that when listening to CDs via the stacker but with the MP3 player plugged in and switched off, the CD volume is very quiet. This is something to do with the way that the new auxiliary in changes the impedence of the line in from the stacker. Changing to a switched socket would certainly fix it, or you can just unplug the stereo lead from the auxiliary socket. Document written by: Moph on 26 2006>, Copyright © 2006 Moph, all rights reserved.